Are Jeweled Teeth An Old Trend? 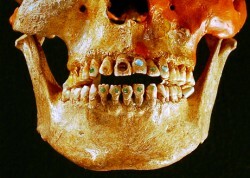 Who knew that our ancient ancestors started today’s trend of jeweled teeth way back in the day? I came across this article from a few years ago that says scientists have found 2500 year old skeletons in Mexico with “blinged out” teeth. Its amazing the skill ancient dentists had to be able to drill and attach jewels to the teeth without harming them. Dr. Nichole Martin may not be one to attach diamonds or rubies to teeth but if you are looking to beautify your smile with porcelain veneers, teeth whitening or other cosmetic dentistry in Lynnwood she’s the right dentist for you!